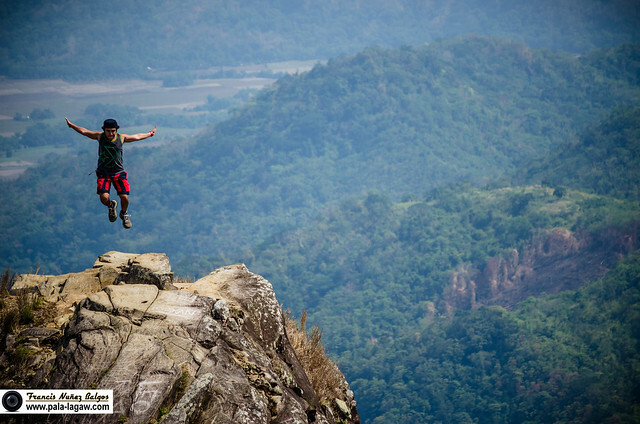 Mt Palay Palay or more popularly known as Mt Pico de Loro is one of the esteemed outdoor destination near Metro Manila. This is one of the mountains that I have planned to climb for a long time now but didn’t get the opportunity until an invite came from a fellow travel blogger Arnie of The Kid Wanderer. 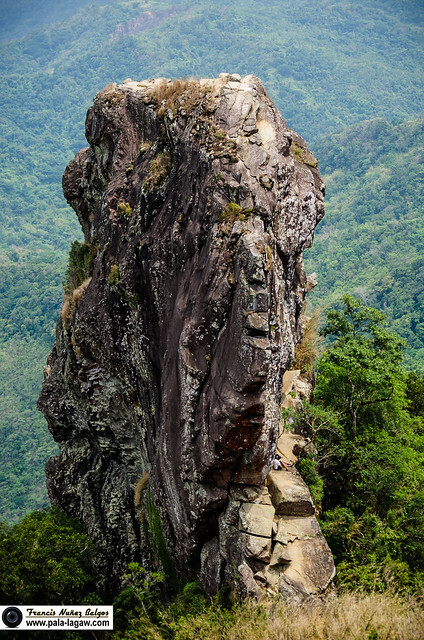 Known for the rock monolith that had earned its pseudo name Pico de Loro (Parrot’s beak), the proliferation of Social Media had drawn numbers of visitors and climbers in the last few years. 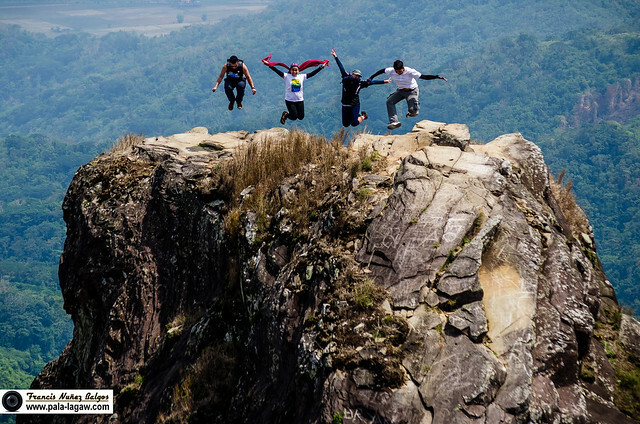 The challenge of scaling the rock monolith is death defying and is said to only draw the daredevils and the-not-so faint hearted ones, more so for the 2nd camping site is a place shrouded in bamboo’s near the ridges of the mountain summit, offering a sweeping panorama of the surrounding terrain of forest, coves and rolling hills. Beware: Daring Jump Shot and Hiking Photos Ahead. Please read through to fully comprehend the chronology of events. 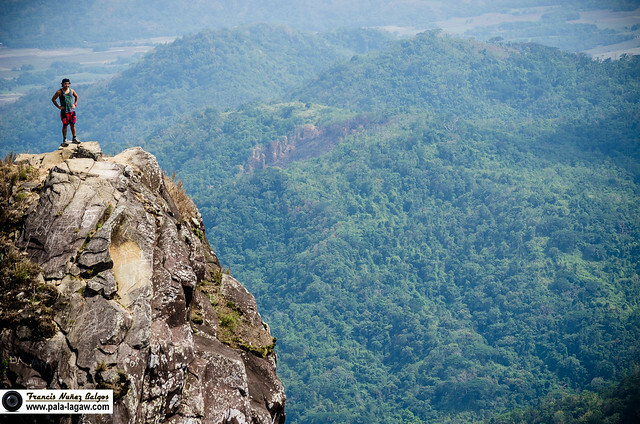 One may have to consider that Mt Pico de Loro may already have everything that it can offer to an outdoorsman. 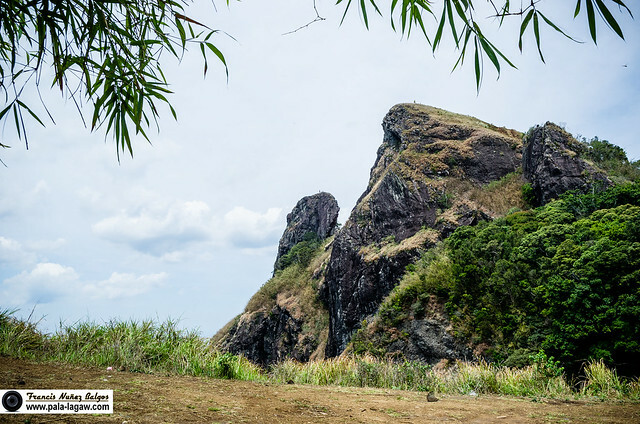 What is in store is very attractive, the rock monolith can be scaled by a rope in its vertical side, the bamboo shroud, the landscape views of the coast of Bataan, and the nearby mountains that litter in Batangas. 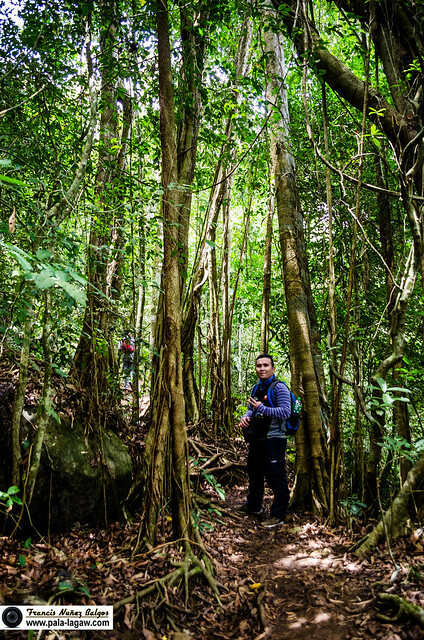 Though a minor climb, Pico de Loro's gradually ascending trails are mostly shaded by tree tunnels; it is still a mountain to be respected. I did this climb with a team of kindred personalities who understand the rigors of climbing a mountain; we were daring perhaps that we even brought with us a 4 year old boy for his 2nd climb. The boys Mom just can't be tied at home babysitting and I find it perfectly logical to introduce someone young as they may with anything outdoors. When climbing mountains, I usually prefer going on a camp for an overnight trip, though tiresome with all the tools you have to carry back and forth, it is much more pleasurable especially when you get to time it with the Sunset and Sunrise. 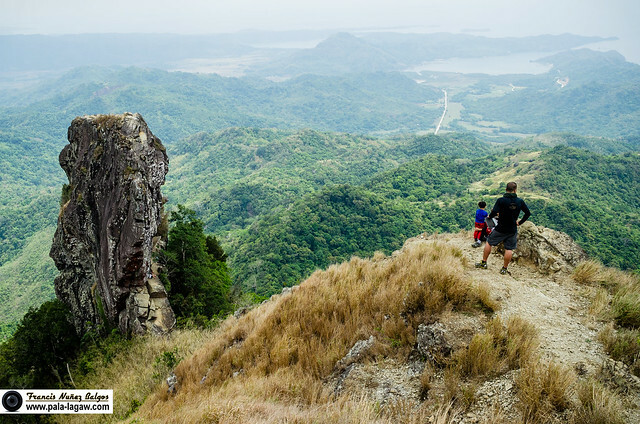 On a mountain summit with 360 degree views like Mt Pico de Loro, you would not want to miss the opportunity to photograph the golden hour in this landscape. 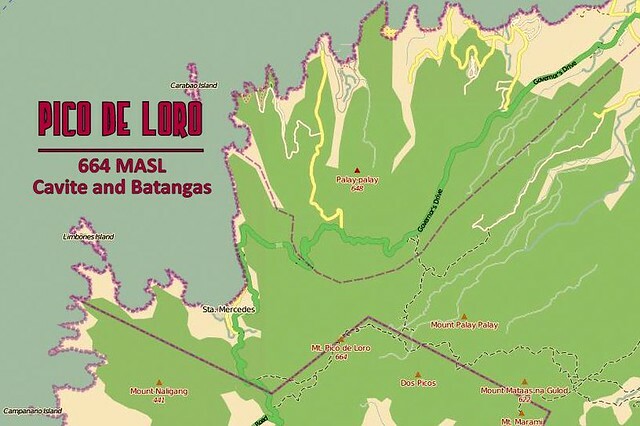 Its great that places like Pico de Loro are just a drive away from Manila. I actually read this article called "Residential Properties close to Filipino landmarks" that was posted in lamudi.com.ph and it was about how you don't always have to travel far to see great sights. 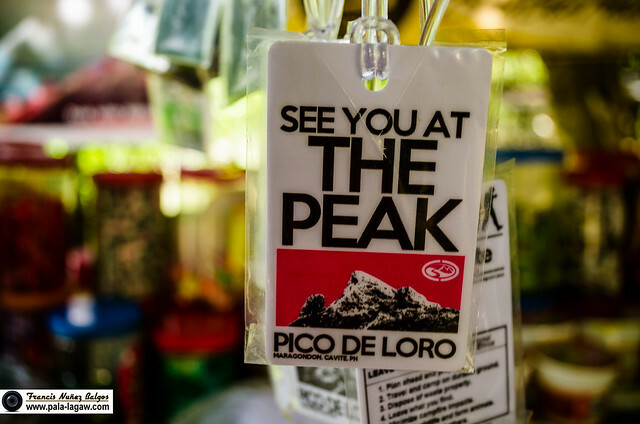 Pico de Loro is exactly an example of that! 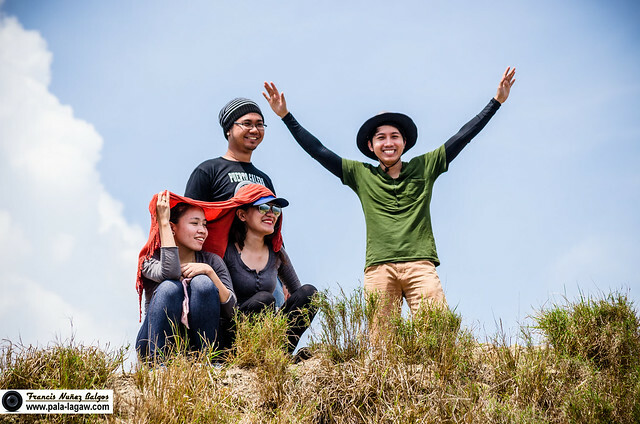 Still in the midst of Dry season in the Tropical Philippines, every trickle of sweat was felt from our jump off point in the DENR Office and the Magnetic Hill in Ternate Cavite. We were ready with many bottles of water to fill our back packs. 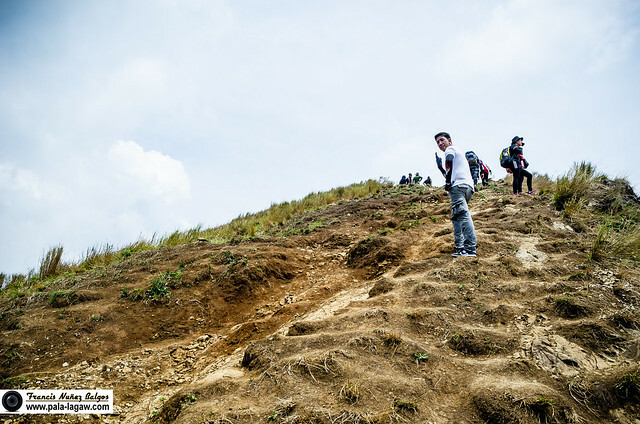 The trails are packed dry of earth clay, I can only imagine what it would be like to hike this mountain during the rainy season, its another thought to ponder on another adventure, I'd just imagine the mountain summit in rain clouds. Pardon me, I'm crazy like that. Perhaps the dirtier event would elicit more fun memories to get me by when my corporate life become too dreary. Our little Man of Steel likes to be called Super-Spidey Man. 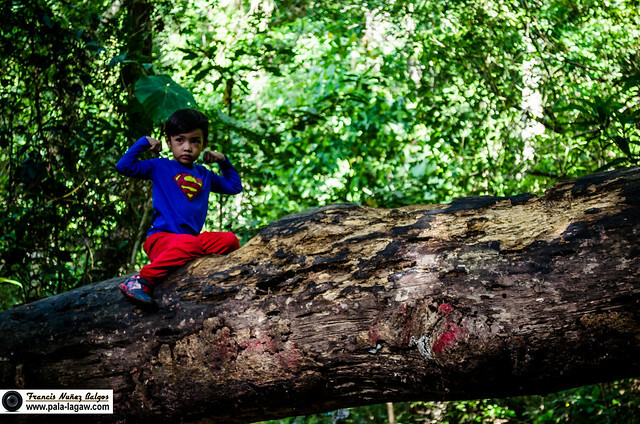 He's our inspiring superhero, only 4 years old, the youngest I've met on a trail. And he's been on a more challenging mountain than Pico de Loro. I find him to be very gentle of disposition but not easily daunted, unlike any other precocious and spoiled kids his age. It's not like he's befuddled, he understood what was in store in this climb since the start. Other kids would have wailed or gone into tantrums at some point, but he only ask to be carried away when he was tired. I've never heard him raise his voice to some unknown decibels that children do when they want to attention. 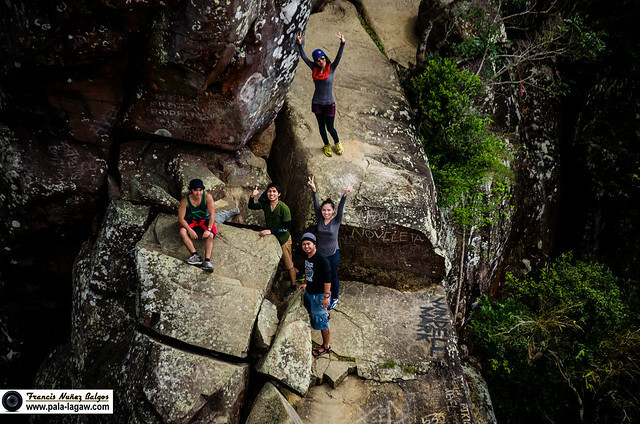 This outdoor team headed and gathered by Arnie is already acquainted with each other, so our descent was filled with friendly conversations, and since most of them are ladies, we get to stop for some selfie in monopods at every take fives. I'm not very talkative and definitely not someone who would walk up to a stranger to strike a conversation. It was a relief that as I observe everyone, they all have a very positive disposition and utmost respect with each other. People may climb the same mountain again and again. but would find that every one of them is different, the memories created and friendly bonds can last long after the climb itself. New found lady friends are similarly guilty of wanderlust. 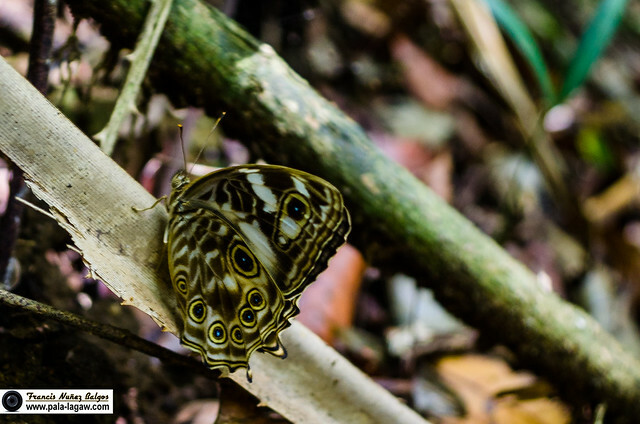 Little treasures along the trail, I captured this butterfly in photo in a dead leave along the forest floor. It's pretty much alive, but I think this creature is near death as butterfly's do expend their life force in flight that they don't live very long. 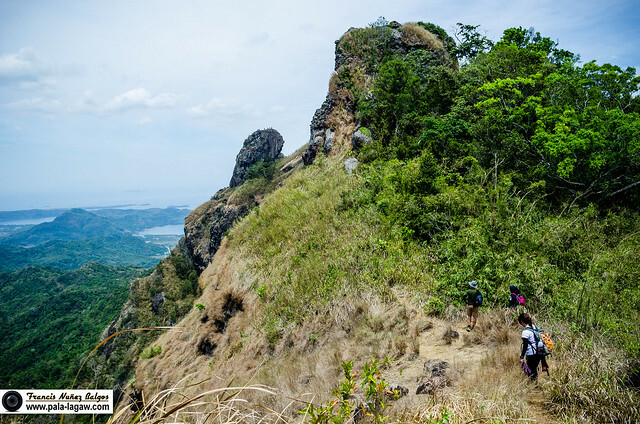 One thing about the trails of Mt Pico de Loro is that it can be tricky and since guides are not required, we just assumed that due to this date being a mother's day weekend, we would find many climbers along the trail. Tough luck as we would soon find out that indeed there are many people in the campsite, but that they had already been there camping since yesterday. It was the first time for me to encounter a trails littered with dried bamboo leaves and the bamboo shoots only make it worse by making the terrain all too similar in every direction. We missed by misjudging a fork in the trail, we only realized this when we started ducking our heads just to pass, or that we need to squeeze in tight places in between bamboo's. It was such a relief when we finally emerge into an open space with a view of the mountains peak and monolith, a view that we knew to have only been seen by a few souls. We were still lost, and the campsite that we intend to find is beyond the huge boulder before us, with the thick foliage of bush and trees blocking our way. None of us, the few who got lost had experience with trailblazing. 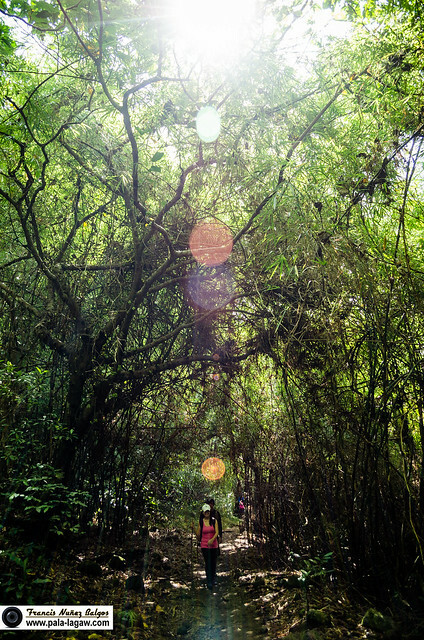 Luckily though, we found an old trail that may lead us out of the predicament, too soon to have said my thanks perhaps that we found ourselves in our hands and knees. Setting dead bamboo's out of the way and tethering in rocky ravines, blindly following the noise we hear from the camp site. Imagine the surprise looks of campers as we emerge from the thickest of bushes instead of the wide trail that most campers come into. We found ourselves in a clearing, with views of the terrain, and our path is blocked by the a huge boulder and trees. 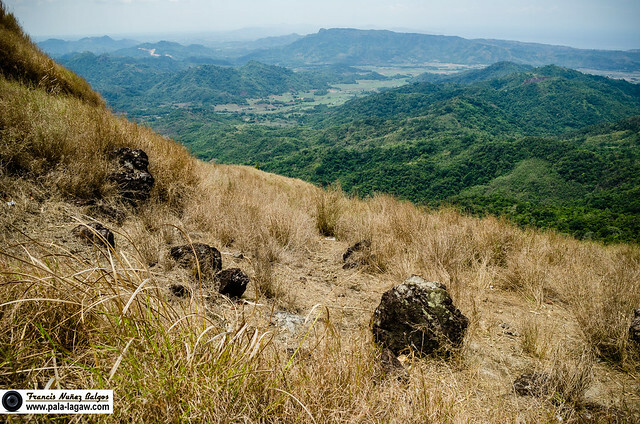 It's amazing to see this part of Batangas province from our vantage point. 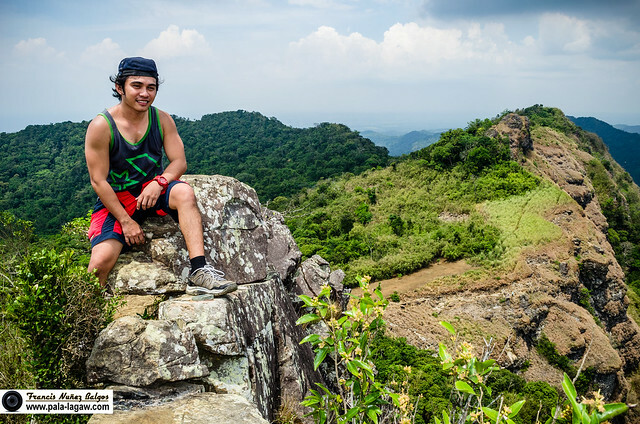 The campsite of Pico de Loro is an amazing vantage point. It offers a high altitude view of the foliage and rugged landscape. The trusts up sedimentary rocks that make up most of the rocky terrain had some of the steepest wall, but its highest summit is contrast against all the green and rocks surrounding it. The summit looks just like a bare hill of steep clay and dust. Once reached, there is no shade available to hide from the scorching sun, so an umbrella is needed. Tethering on the edge, just one push and that would be the end of me. In here, I'm sitting on top of a rock wall with unfathomable height. A very steep incline that without footholds, this would have been impossible even if we climb in our hands and knees. 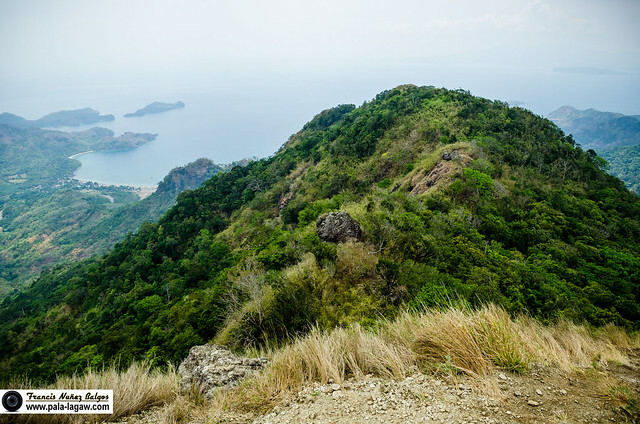 The coastline as seen from the summit of Pico de Loro. Just as I thought the summit would be, I can see as far and wide from here, Sunset over the coastline and Sunrise over the lush landscape of Batangas would be expected. Think I've already mentioned a lot about the Monolith itself, but climbing and seeing them in photos is another. So in this part, let me show just how daring we became. Photo shot with a Telephoto lens from the Summit, it's like a huge building and just to give you a perspective on how big this monolith is, you can see in this picture the two guys trying to pass through a tight turn in the side pathway. It looks like we were having fun, but we were actually just realizing the daunting task ahead of us. 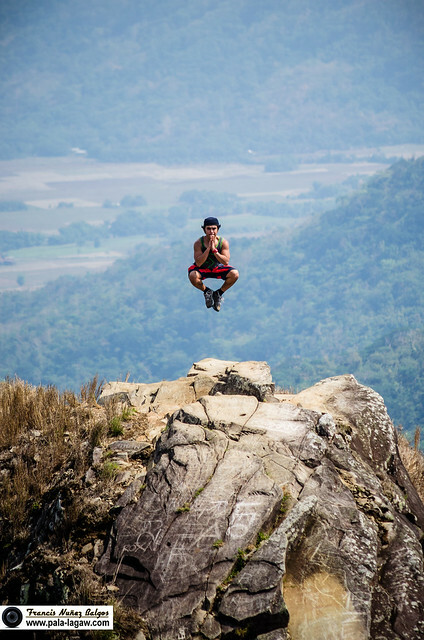 Standing from the highest rock point, I gave my most calculated and nerve wracking jump shot ever. And well, I have every one's jump shot photos too. I just don't know if their mothers would approve. Hahaha! Arnie of the The Kid Wanderer, thanks for having me in this climb. I really loved this mountain. It was my first climb that convinced me to climb more mountains. To date, I have climbed it four times. Haha. Hey Samantha, wen't to your blog too.. I remember hiking Pico a year ago. It was quite an experience since it was only my second time hiking up a mountain. Great shots! It must've been quite an experience to get to the top of the mountain and the monolith. Your photos look great! Wish I could also do something like this :) Someday. Best Jump Shots you have there! (kahawa ba, haha). Blood flow rising up as I watch your photos on top! Is it breezy and cool when you're on top? And that jump shot can be the scariest jump I'll do! Whew! The jump shot was insane. 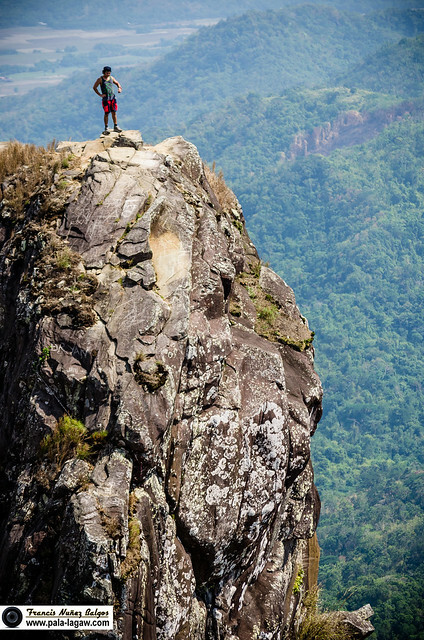 I would want to climb the monolith of Pico De Loro. 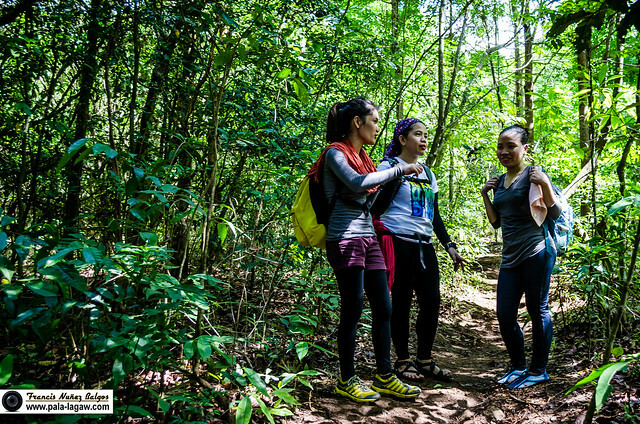 I joined at trail run at the Pico De Loro and next time, I hope to go all the way to the top. I felt that I hiked and did the journey with you. All breathtaking photos most especially those few jump shots!! Hope my son will be like that 4 year old kid who already has a sense of adventure in him. Seemed you enjoyed the fun an the place too. Just watching people do their trails an travelling. OMG! i don't think I could pull any of the jumpshots shown here. You must have saved a lot of courage to them. GREAT shots, btw. I love your pics and the jumpshots. It was a decade ago the last time I climbed at Pico. You made everything look so easy with those jumpshots. Btw, would you know if they still allow overnight camping here? Thanks! I havent climb again in this mountain, but as far as I know..
Hi sir! Just would like to know what specific camera did you used? Thankyou! These photos are shot with my old Nikon D5100.